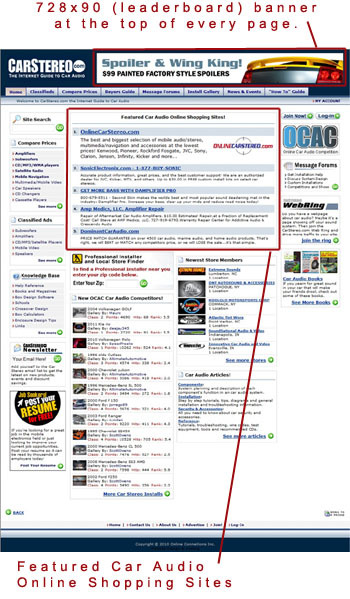 Get your online store listed in our "Featured Car Audio Online Shopping Sites" located on the main area of our home page and through on the site. You choose how much to pay when customers click on your listings. The higher you bid, the higher your site appears in the list. You pay only when targeted customers click through to your site. Pay as little as 5¢ per click through! No Monthly Minimum, Cap it at any Dollar Amount you like! Your site can be linked and receiving qualified buyers almost immediately! 728X90 Banner Ads at 15¢ per click through, you pay only when targeted customers click through to your site! Banner run on the top of all pages and advertiser has unlimited access to their detailed banner statistics 24 hours a day, 7 days a week. There is a one-time $20 sign up fee which applies towards your account payments. So, it ends up costing you nothing to join, you only pay for the advertising you use! We do require having a valid Visa or MasterCard on file, to which we will bill your monthly payments.